If you want to get that perfect professional look to your blonde hair coloring, it's crucial that you don't forget the toning step. A good toner like the Wella T14 is something that your professional hairstylist will always use, but it isn't included in your average over-the-counter hair dye set. Toner is essential. Once you've bleached your hair, you can be left with unwanted brassy or even orange colors that don't completely disappear even after dying. A good toner mixed with the right developer cancels out preexisting brassy tones in the hair to achieve the most lustrous, saturated, and long-lasting color application possible. Unlike bleach, though, the toner is not a one-size-fits-all gig. The Wella toner suite features eight toners in the ash, beige, and silver color families. The toners, which come in 42-millimeter liquid bottles, claim to lift and simultaneously tone your hair color. They work on naturally blonde or bleached hair to create delicate blonde shades while eliminating unwanted color warmth, brassiness, or orange hues. They also work to tone double-processed blondes. Do they work as claimed? And which toner in the Wella range is right for you? To help you decide, we've reviewed the Wella T14 and three others produced by the brand. What Is The Wella T14 Toner? How Does The Wella T14 Toner Compare To Other Wella Toners? To effectively lighten your hair and achieved an excellent new color, it is crucial to use toner to remove your preexisting hair color and prep your hair for its new color application. It uses a unique 1:2 mix ration of their patented Color Charm Liquidfuse to peroxide. Toner works by stripping your hair of its preexisting warmer colors and eliminating any brassy tones that might be present in your hair. The Wella toner suite, which includes the Wella T14 toner, combines value, reliability, and vibrancy in one economical package. The unique 1:2 mix ratio gradually remove unwanted hues while softening and lightening the hair further. Wella toners use Color Charm Liquidfuse technology to saturate, permeate, and fuse the hair with color. Color molecules combine with color activators to form a gel. This gel then penetrates the hair shaft to deliver rich hair color. Then, the color fuses with the hair's cortex to prevent fading. When applied according to package directions, Wella toners provide long-lasting results. You can expect to achieve a color true to its tone with excellent coverage of any gray hair you might have. The toner also conditions and shines hair and does it even better than most of its competitors. The result is long-lasting color and full gray coverage in just 30 minutes. 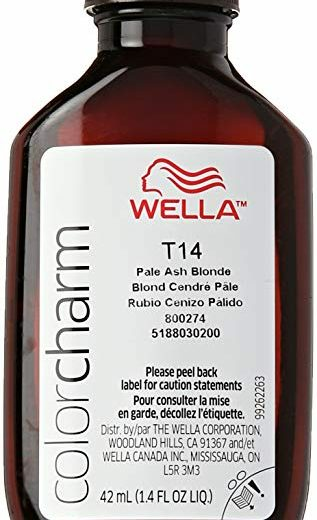 The Wella T14 Pale Ash Blonde belongs to the silver color family, which ensures that consumers with light blonde hair achieve that difficult-to-get icy platinum blonde look. Its violet-blue base cancels out orange and yellow hair tones, resulting in attractive ashy tones. The ashy tones of the Wella T14 toner are darker than those of the Wella t18 toner, making hair look glossy and icy rather than washed out. The entire Wella toner suite is economical and wallet-friendly. Wella toners can be purchased at Amazon or eBay for under $10. The only thing to watch out for is shipping. Some sellers offer a lower price, but when you calculate shipping costs, there are no savings. To see the true lowest prices, always look for the "free shipping" option and then choose among those offerings. The directions for this product are pretty straightforward. First, wash your hair and thoroughly remove all shampoo and conditioner. Then mix the developer with the toner in a ratio of 2:1. Apply in sections to your hair, being careful not to miss any part that you want toned. You'll always want to start at the bottom of the hair shaft and end with the roots to avoid getting a greyer look rather than a blond one. In the end, many reviewers refer to it as "foolproof." There's a reason that a lot of people have a professional tone and dye their hair. There's just no avoiding the fact that applying a toner or a hair dye is time-consuming. However, once it's on, you only need to wait 30 minutes before washing it out. That's about as good as you can get with a toner. The end result can only be expected to last about two weeks before you'll need to reapply. Since it contains peroxide, over time toner can be hard on your hair. But you can also expect a more even and muted pale gray color than you get with the other toners. In the end, yes. It's especially good for double processed blondes and anyone eager to have a warmer gray while getting rid of warm hues and tones they don't want. The Wella t18 Lightest Ash Blonde toner features a violet base belonging to the ash color family. This violet base cancels out any preexisting yellow tones present in the hair to achieve a platinum or beige blonde end color and ensure that users get a more comprehensive gray coverage thanks to its warmer and darker hues. Wella advises that the t18 toner be used by people with pale blonde hair. Further, to ensure the most effective color application possible, consumers starting out with orange-hued hair must bleach their hair and make it one shade lighter before using the t18 toner. Using the Wella T18 toner is very much like using the T14. However, extra steps might be involved before you start, depending on the exact hue of hair you have. This is especially true if your hair is orange. You'll need to get your hair to a blonder color before you'll see results with this product. Use a 1:1 ratio of the developer to the toner with the T18. As with the T14, the application can be time-consuming. Once it's done, it's a quick 30-minute wait and then a rinse. This one has a few more negative reviews than the T14 in terms of final result. This could be because users aren't making sure their hair is the right color before they begin, but whatever the reason it seems the T18 is just a bit less reliable. Definitely, especially if you read the fine print. The most important thing is to make sure your hair is the right hue to use this product. If it's not, it will look wrong - just as the product says it will! The color washes out in a few weeks' time, which requires more frequent toner application. The Wella t10 Pale Blonde toner features a violet-blue base belonging to the silver color family. This violet-blue base cancels out any preexisting orange and/or brassy yellow tones present in the hair to achieve a sandy, beige blonde end color. The gray coverage is on par with the Wella T14 and t18 toners. Wella recommends this product for consumers starting out with lemon-hued bleached blonde hair, and you can expect a more silvery look than with the T14 or the T18. The application process is similar to that of all the other products in the Wella line. Although all toner application can be time-consuming, the Wella T10 reportedly works even faster than other products in the line. Users recommend watching carefully after application to make sure you get the precise color you want. This is the Wella product that professionals tend to use the most, and that is reflected in the end quality. While end results will be less dramatic than the T14 or T18, they are especially good for taming harsh hair colors and preparing the hair for a different treatment. This product gets lots of positive reviews for delivering exactly what it promises for those who use it according to the directions. 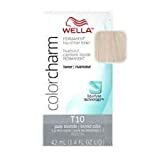 The Wella t27 Medium Beige Blonde toner features a medium-beige blond color in the beige color family. The base cancels out pale colors and renders the hair a light beige. The gray coverage is not as good as with some other Wella products, and it may need to be combined with a toner from the Red Family in order to effectively cover gray. Wella recommends this product for pale yellow hair color. Uses the same application process as the Wella T14. It should be mixed with two parts developer and allowed to develop for 15 minutes before application. It can take longer to develop this color, and some people will need to keep it on their hair as much as 15 minutes longer than other toners in order to get the desired result. This makes it more likely to overdo toning, which can have negative results. For people who know what they're getting into, the end quality is great. It's easier to end up with a color you don't want. Bbe sure to read the directions carefully and comply with all instruction. As with the T18, it does deliver what it says. It will not look good on those it is not recommended for, just as Wella explains, so be sure to read all directions carefully before buying. The Wella company has won the Stylist Choice's Favorite All Over Color Company Award, and it's easy to see why. The company delivers consistency over a range of products, all of which are simple to use and deliver on what they promise. Your choice of toner will depend on the color you're looking for in the end. If you want a warmer blonde, the T27 is probably your choice. If you're looking for an ashen blond, the T14 is the better choice. Whatever you choose, just be careful to follow directions and make sure you're using the products on hair that is in the proper state. Wella is quite clear on their packaging about what colors won't work with certain toners, so be sure to read carefully before you buy. Follow directions, and you'll achieve the perfect look in no time.